Learn about the latest news and upcoming events from the WHA and its member agencies. Each year, the Washtenaw Housing Alliance and Washtenaw County Office of Community and Economic Development coordinate with local human services agencies to conduct a federally mandated count of all unsheltered and sheltered persons experiencing homelessness on a single night in January. The unsheltered count takes place from the hours of 4 am – 8 am and is conducted by a team of approximately 50 volunteers who canvass the county, some on foot, some by vehicle, surveying people they find living outside. 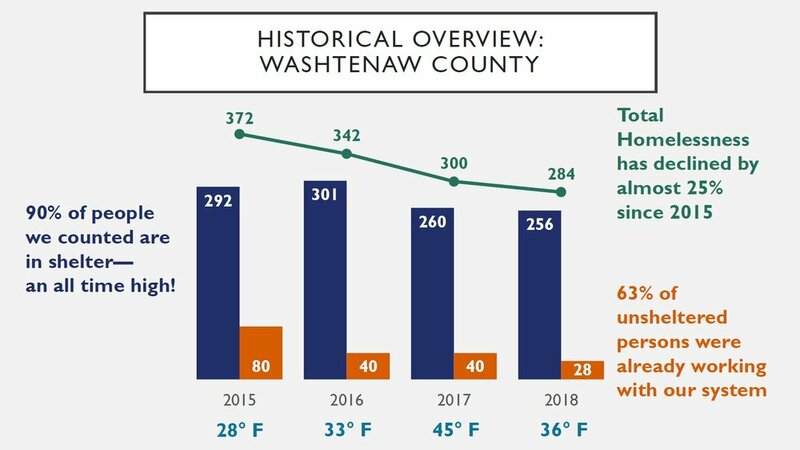 The Point-in-Time Count provides our community with a snapshot of those experiencing homelessness and serves as a way to measure the progress being done by our Continuum of Care to make homelessness in Washtenaw County rare, brief and non-recurring. This year, 28 people were found living on the streets or in places not meant for human habitation, while 256 people were counted in shelter or transitional housing programs. In Washtenaw County, total homelessness has declined by nearly 25% since 2015. The State of Michigan saw a a decrease of 14% and the United States, 2%. Another important data set captured by the PIT Count is the number of families experiencing homelessness. This year, no unsheltered families were found. The chart below shows family data from this year's count. Out of the 284 folks counted, 73 were part of families. Additional data captured identifies those who self-report a substance use disorder or mental illness. Veteran homelessness and chronic homelessness data is also collected. To view the complete 2018 Community Debriefing, please click HERE.